Location: Cranborne Chase, Dorset, England. Grid Reference: 50° 57' N. 1° 58' W.
The largest cursus in Britain. Now viewed as being two cursus end-to-end. The combined length of 10km, and an estimated 0.5 million man-hours labour make this one of the most significant prehistoric remains in Britain. 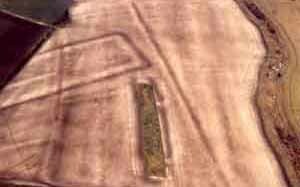 Today, much of this great earthwork is flattened and can only be see through crop-markings or soil markings which in the right conditions, allow one to see the outline of the cursus stretching across the Dorset landscape. As with several other cursus, Dorset cursus appears to have a complimentary henge nearby, in the shape of Knowlton Henge, which is only a short distance to the east. With an estimated half million man hours in construction, this earth-work counts as one of Britain's largest megalithic constructions. Unfortunately today, there is left to see to the untrained eye. The Dorset cursus once consisted of a pair of parallel banks (1.5 m tall) running about 82 m apart, with external ditches 1.5 m deep and 2 m wide. One bank is regular, whilst the other meanders, a feature found at several other cursus in Britain. Believed to have been constructed in two different phases at around 3,300 BC, this cursus must have been of great importance to the Neolithic community that gave birth to it. Carbon Dating Results: Dorset Cursus. The Southern section of the cursus is considered older than the northern section. It has been suggested that the Dorset cursus was designed to be experienced from North-east to south-west, towards the great 'Death island' formed by the Hambledon Hill causewayed enclosure, a few kilometres away (Tilley, 1994). 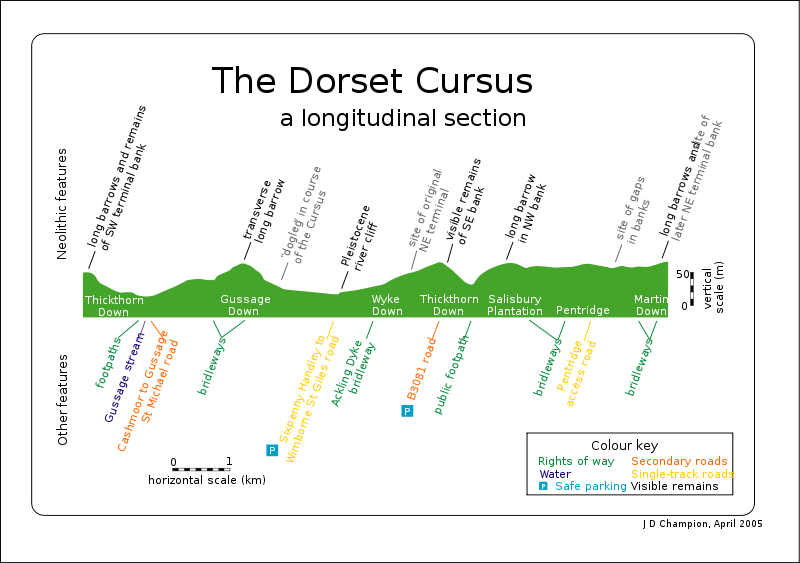 What is surprising about the Dorset Cursus is that its overall design makes little sense except to someone inside it. From a distance, despite its great length, it would not have been very visible - indeed, some sections may have been dug through wooded areas. The same is true of the curses at Stonehenge and Rudston. The concept of a cursus seems to exclude outsiders. 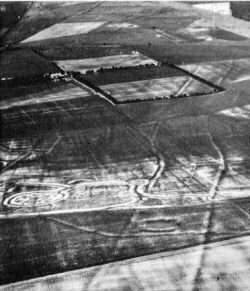 This is also indicated by the lack of recognisable entrances through the ditches and banks. However, to those who did stand within it, the Dorset Cursus makes its most impressive visual impact between the Bottlebush terminal and the long barrow on Gussage Cow Down, if only because this includes the longest stretch which can be seen from one vantage point. And this alignment is the midwinter sunset sight line. In fact, there seem to be five astronomical sight lines between the cursus and particular mounds, or between mounds. Again, other cursus seem to have been built in similar ways. The Dorchester on Thames cursus aligns on the midsummer sunset, while Aubrey Burl has suggested that the Stonehenge cursus could have marked the equinoctal sunrises. Cursus often run across valleys, and their setting and scale can only be fully appreciated by standing at the terminals which are usually intervisible. It has frequently been pointed out that many cursus have their terminals close to water courses or run across an interfluve between two rivers. This is especially true of many valley-situated cursus, and it may also be noted that because of their proximity to rivers some cursus are wholly or partly covered by alluvium. The Dorset cursus is no exception to this, crossing a river and three valleys. The Cursus' only significant astronomical alignment is related to its south-westerly orientation: an observer at the Gussage Cursus terminal on Bottlebush Down would see the midwinter sun set behind the long barrow lying across the Cursus on the ridge of Gussage Down. Bradley (in Barrett et al. 1991) emphasise the way in which this phenomena could only have been witnessed from within the cursus itself. The long-barrow itself has been suggested to have been built before the cursus. A connection between the cursus and long-barrows (other cursus). There are sever other long-barrows on Cranborne Chase, and many of these are still found along the route of the Cursus. This association between the Cursus and the alignment of these barrows suggests a common significance. The cursus incorporates at least two long barrows. On Gussage Hill, ST 91 SE 9 lies across the interior of the cursus, while the Pentridge Cursus has SU 01 NW 47 actually incorporated into the bank of the northwestern side, although the barrow's alignment differs slightly.